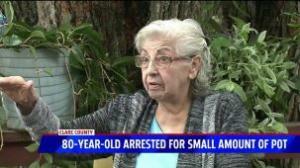 A Clare County, Michigan, sheriff's deputy arrested an 80-year-old grandmother for small-time medical marijuana possession after going to her home on an unrelated matter and smelling it. The grandma, Delores Saltzman, is a patient whose card had expired. She spent a night in jail and had to deal with a court case because the deputy's zero-tolerance approach to marijuana precluded a sensible resolution to the matter. As local TV station Fox 17 reported, on the evening of June 13, Deputy Ashley Gruno knocked on Saltzman's door. She was trying to find Saltzman's granddaughter to return a lost phone and ID. Things went haywire when Deputy Gruno smelled marijuana from the front porch. The deputy asked who the marijuana belonged to, and Saltzman explained it was hers and that she was a medical marijuana patient. Deputy Gruno then searched the house, seizing several pipes, four joints, and a purple jar with a small amount of marijuana. Saltzman said the total amount of marijuana seized was less than an eighth of an ounce. Deputy Gruno then handcuffed Saltzman, place her in a patrol car, and took her to jail, where the arthritic grandmother spent a long night. "That''s ridiculous what they do to people, they don't need to make you that cold," she said. "Old Arthur was screaming at me" -- a reference to arthritis, her son Mark clarified. Saltzman also suffers from diverticulitis and muscle and bone aches. Saltzman and her son credit marijuana with saving her life. It helped her appetite when she was sick, helped her heal after surgeries, and eases her pain from health conditions, they said. "After I smoke, I go down to a one, pain-wise," she said. "Before I smoke, I would say I'm an eight right now. Marijuana saved my life because I had a bad bleed about four years ago, and Mark took care of me," she explained, adding that when doctors prescribed her opioids, she suffered stomach pains and vomiting. Saltzman said she went public with her story in the hope it will help others. "That's what I want people to do: Don't be ashamed of something that's going to make you feel better." The deputy was overzealous, said Mark Saltzman. "I just thought it was absolutely ridiculous to put her through this like that. They could have just given her a ticket, and [said] just show us your card later. Reapply for your [medical marijuana] card, show us this, and then drop the charges." Clare County Prosecutor Michelle Ambrozaitis largely agreed with Saltzman. While she said a possession of marijuana charge was justified because of the expired card, she added: "However, our goal is to ensure that individuals who utilize medical marijuana are doing so legally. As such, Mrs. Saltzman was encouraged to obtain her medical marijuana card and if she did so, the case would be dismissed. She did obtain her medical marijuana card, and the case was dismissed." Clare County Sheriff John Wilson didn't comment on whether his deputy should have arrested Saltzman and said he agreed with the prosecutor's decision to dismiss the case after she renewed her medical marijuana card, but stuck to his guns on Saltzman's criminality: "This person was illegally in possession of marijuana," he said. Michigan will vote on legalizing marijuana in November. If advocates had managed to get it on the ballot in 2016, Saltzman and others like her would not have been subject to arrest. She is calling on her fellow Michiganders to vote to legalize it. "I'm hoping that we all learn a lesson from this and that we make amends, and people will get out and vote for it," Saltzman said. "We are the ones that have to stand up. We are the people, and we just have to fight for our rights." One can hope that most Michigan police officers and even Deputy Gruno now would be more discriminating than this. But they might not. Until the people do fight -- and win -- Michigan will see more pointless arrests under the prohibition laws. When it comes to marijuana legalization, Trump is snake-oil. There will be a crackdown on legal marijuana, eventually, if Trump is not defeated. I call that a safe bet -- only it is one you never hope to collect! Stop Trump -- vote Democratic! Register now! Marijuana.com is a front for Trump disinformation campaign! one of the things that bothers me most about the american criminal injustice system is how unaccountable and unapologetic it is when it comes to abusing power. no accountability whatsoever, and almost never do they admit to being in error or apologize to anyone who has been abused.